Bud Plastic Enclosures: We Are More Than Just The Metal Guys » HHP Associates, Inc. Bud Industries was founded with a focus on metal enclosures and rack, so people often forget that Bud has a broad line of plastic enclosures today as well. To do so is to risk overlooking one of the broadest lines of plastic enclosures in the industry. It would probably surprise most readers to learn that Bud provides nearly 60 different products families in small plastic enclosures. They range from plastic rack mount chassis to small potting boxes. 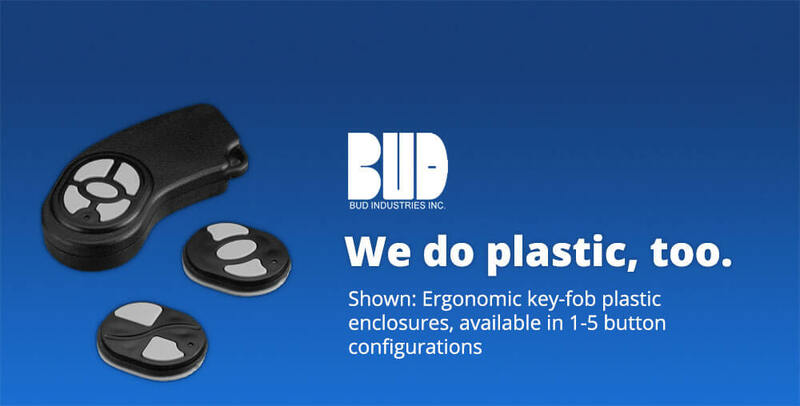 Bud offers two series of key fob type plastic enclosures. The first, Hand Held Grabbers style F, and the more traditional rectangular shaped enclosures with either 2 or 4 buttons. Made from ABS plastic that is UL 94-HBrated, the buttons are gray silicon rubber. The second series is more ergonomically designed. The smaller sizes have rounded edges and come in 1 to 4 button configurations. There is a fifth size, with 5 buttons that has a curved handle and it is a bit more substantial and so easier to hold. This series is also made from ABS UL 94-VO plastic with the same gray silicon rubber material for the buttons. All are easy to pop open for installation of your pc board and we provide drawings for both board and button circuit layouts. Step file drawings are available for all parts. Bud can also provide different button configurations upon request.